This collaboration is one for the books. 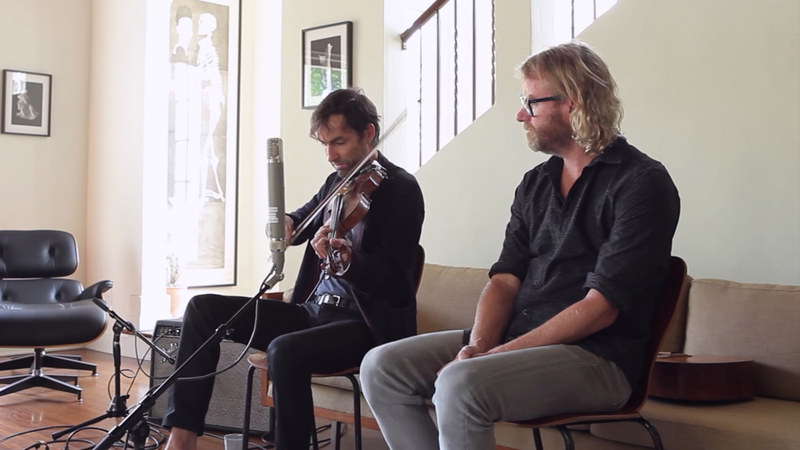 What happens when you put Andrew Bird and The National's lead vocalist Matt Berninger in the same room? Absolute Magic. The pair recently teamed up for Bird’s YouTube series Live From The Great Room, which features artist collaborations in the Chicago native’s living room. For this episode, the duo chose to play a soft acoustic rendition of Lou Reed’s “Perfect Day”. Bird started it off by plucking away at his violin and whistling soft melodies into a looping device. When the two were ready to begin singing, the uniquely dark vocals of Berninger swept through the room, as he followed Bird’s lead on the guitar. Between the beautiful violin lines and the heartfelt lyrics, the delicateness of the song held throughout. At the end of the performance, Berninger joked to Bird, “I’m coming back as well, every week, for the next few weeks until you won’t have me anymore.” We’d be thrilled to hear another great collab from these two, but for now, you can catch other Live From The Great Room videos on Bird’s YouTube channel. Check out the collaboration below as well as the original track, and make sure you’re tracking Andrew Bird on Bandsintown so you never miss another one of his shows!